of hope in every second Hillside house. smiling at him the way you smiled at me. cloves; basted with beer and honey: baking. 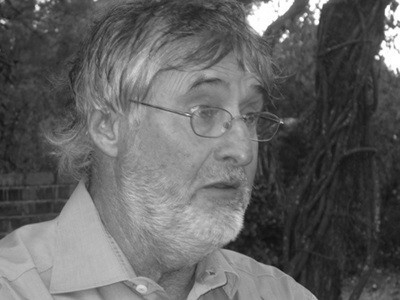 John Eppel, born in 1947, is an English teacher in Bulawayo. He published his first poems in the 1960s, in Two Tone, and his first collection, Spoils of War, in 1989. John won the Ingrid Jonker Prize for Poetry for Spoils of War, and the M-Net prize for his first novel, D G G Berry’s The Great North Road. His second novel, Hatchings, was chosen for the series in the Times Literary Supplement of the most significant books to have come out of Africa. His other novels are The Giraffe Man, The Curse of the Ripe Tomato, The Holy Innocents, Absent: The English Teacher, Traffickings and The Boy Who Loved Camping. John’s other poetry collections are Sonata for Matabeleland, Selected Poems: 1965-1995 and Songs My Country Taught Me. Two collections of his poetry and short stories have been published: The Caruso of Colleen Bawn and White Man Crawling. Poems and short stories of Eppel’s have appeared online and in many anthologies and journals, and his recent collaborations with other writers include Together, with Julius Chingono, Hewn from the Rock, with Philani A Nyoni, and Textures, with Togara Muzanenhamo.